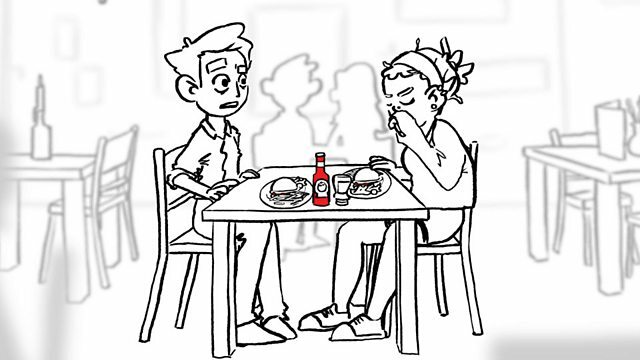 In this episode, Daniel is on a date with someone who has very little interest in personal hygiene. What phrases does he use to move the conversation along? Watch the video to discover some key dating language. Oh hi, are you Daniel? Yes, I am Daniel. Are you Jo? Yeah, I am. Nice to meet you. Lovely to meet you too, Jo. How are you? Oh God, can you smell that? What is that? No, is it the food? I could smell her coming. When we shook hands, her hands were really oily. It was a little bit… yeah, it was quite strange. Erm, so I’m gonna get, erm… I’m just gonna go straight in for burgers. You have to order your chips separately. It’s a bit annoying, but they’re really good. Shall we share a salad? I’m not that fussed about salad, but like crack on by all means. Yeah, I might put some in the bur… yeah actually, let’s get salad and coleslaw and I could put some in with my burgers. Yeah, adds to the texture. Oh sorry, I think you actually just got a little bit on me. Oh here, do you want to use my tissue? I just used it once. Oh God, that’s really sticky. Not really for me if I’m honest. Her personal hygiene was… it was pretty gross. So what do you do Daniel? Tell me about yourself. I’m just gonna… sorry I’m just gonna… you’ve got a bit of erm… Burger on your plate I’m gonna… Here, try some of this? This is really nice. Here, here, yeah… open wide, open wide, great. Yeah, it’s nice to have… well seasoned. Yeah, so what do you…what is it that you do again Daniel? I can’t remember if you told me or not. I work in advertising actually. Wow, fancy. Yeah, what does that mean? We work with lots of different accounts. We have… we work with an Italian restaurant chain. We actually have a brand of tissues as well. Yeah, which you might be interested in. It did not. She dropped a burger on the floor, and picked it up and carried on eating – midway through the date. I’m just gonna ask to get some mayo and ketchup and stuff cos I like all the sauces. Well, we’ve got two bottles. Ooh, but that fell on the floor. It’s alright. I’m sure it’s clean. I was gonna say actually, you've got… You also have a little bit on your face. Er… yeah, and on the other side. It’s quite charming though, isn’t it? Kind of endearing, isn’t it? That’s I’ve got food all over my face. There won’t be a second date, no. There most certainly won’t. Lovely to meet you Jo. Do you want to use my tissue? So, what do you do Daniel? Daniel said this when Jo said she would get the burger. Which of the following did Daniel say to suggest what to order? Daniel said this when Jo had food all over her face. Which of the following did Daniel say to point out something about Jo subtly? Daniel said this right at the start of the date. Which of the following did Daniel say to greet Jo? Join us in Session 21 to see Daniel go on another date in search of love!